Hearing of “fluorine” or “fluoride” most people nowadays think instantly of dentistry, of dental caries or the different ways of fluoride application to prevent that disorder. But these terms are not inventions of dentistry and the use of fluorides originally was in no way related to that profession. In the 16th century, when Nostradamus demonstrated his prophetic capabilities and Paracelsus expressed his view that the dose alone makes a thing a poison, another contemporary and professional colleague was interested in metallurgical affairs: the German physician Georg Bauer, of Chemnitz. 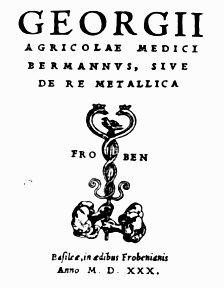 Under his latinized name “Georgius Agricola” he is known in the history of medicine as the man who very aptly described the diseases of the miners of his time (1), diseases which he still ascribed to evil ghosts doing mischief in the mines. This was but a very small aspect in his “De re metallica”, the first written detailed description -fully in Latin- of how to prepare metals from ores and which soon became translated into many languages (2). It even was published in Chinese (3). In his work Bauer explains how admixture of fluxes (“lapides igni liquescentes (fluores)” = lat. : “stones which become liquid in fire (flows)”) facilitates the smelting of ores. Fluxes work as a solvent for ores that would otherwise need much more heat (and thus energy) to become liquid for further processing. The aid, called “Flußspat” (fluorspar) by the German miners, had for the first time been mentioned by Basilius Valentinus towards the end of the 15th century (4), and was more extensively described in one of Bauer´s early works in 1530 (5). Fluorspar occurs in nature in several beautifully colored varieties. The violet variety (“fluores colore violaceo“) looks like amethyst, the green one (“fluores viridi“) resembles emerald and so these varieties were occasionally sold instead of the gems (hence the name “false amethyst” or “false emerald” for fluorspar). If to a sample of fluorspar some acid, e. g. sulfuric acid, is added and the mixture is gently heated, toxic fumes develop which attack glass. There are rumors that already in 1670 a Nuremberg glassworker, Heinrich Schwanhard, made use of this reaction for artistic etchings on glass (6-8), but this could not be verified; Schwanhard rather used nitric acid on a softer variety of glass, as a review by Partington (9) revealed. The first account of the fluorspar process was published by John George Weygand in 1725, the recipe being given him by Matthäus Pauli, of Dresden, who in turn had become aware of this secret knowledge of an unknown English glassworker around 1720 (9). The first, though superficial, examination of the chemical reaction was published by Andreas Marggraf in 1768 (4). Inspired by Marggraf´s work, the Swedish apothecary Carl Wilhelm Scheele started, in 1771, a systematic investigation to find out the chemical nature of fluorspar and the details of its reaction with acids. He too observed the attack of glass by fumes which he obtained by slowly heating, in a glass retort, a mixture of fluorspar and sulfuric acid. The solid residue in the retort, extracted with water, revealed the presence of lime upon addition of ammonia. The fumes, if led into water, released a white mass identified as silica. The resulting solution showed an acid reaction. Scheele called it “Flußspatsäure” (acid of fluorspar, fluoric acid). On adding it to lime water a white precipitate was formed which showed the same behavior as fluorspar, i.e. fluoric acid could again be released upon treatment of the filtered and dried precipitate with sulfuric acid (10). · precipitation of fluorspar if the fumes -or solutiions of the fumes- are led into lime water. The unique ability to etch glass, which proves the presence of a fluoride in a sample, led to the incidental detection of fluorides in samples wherein it possibly would have never been sought. Thus, the physician and chemist Jacob Berzelius, in 1822, found fluoride in a water sample (Carlsbad water) the residue of which he treated with nitric acid in a platinum baker which he covered with a glass that finally became etched. Even though the name “fluoric acid” (fr. : “acide fluorique”, ital: “acido fluorico”) applied to the new acid discovered by Scheele clearly reminds us today of the element “fluorine” bound in it, nothing was known by the time about the chemical nature of this acid, the name being merely derived from the latin term “fluores” for fluorspar. After Scheele´s first experiments, some researchers raised doubts whether it really is a new acid, but claimed it might be simple muriatic acid or an acid derived from the sulfuric acid used in the experiments. Years after Scheele had shown that the acid can also be made by treatment of fluorspar with phosphoric acid or nitric acid (10-12) it was still supposed by some researchers that it might be formed by a modification of phosphoric acid which often accompanies it in natural products (rock phosphate, fossil bone samples) (13, 14). When muriatic acid was identified as a compound of the newly discovered element chlorine with hydrogen (which fact also showed that oxygen [greek: “acid forming”] is not an essential component of acids, as was believed until then) fluoric acid was suddenly considered to be a hydrogen compound of another new element with properties similar to chlorine. The name “fluorine” at first was proposed for the new prospective element, later the term “Phtor” (greek for “destructive”) seemed to be more appropriate because of the destructive properties of its compounds. But “Phtor” was accepted only in the eastern hemisphere (15). The isolation of the new element, to demonstrate its existence, occupied many researchers for a long time. A first step was the preparation of a concentrated hydrofluoric acid by Thénard and Gay-Lussac (15,16). Their product fumed strongly in air, rapidly dissolved glass, and caused extraordinary burns on contact with the skin – a phenomenon the authors described in some detail. Other researchers experienced even more toxic effects, some had to pay a high price (severe disease or even loss of life) for their -finally unsuccessful- attempts to isolate the element, as they were not careful enough in handling the hydrogen fluoride (HF). Thénard and Gay-Lussac also described fluoboric acid, a new complex acid similar to fluosilicic acid. When the famous chemist Berzelius summarized, in 1824, his experiments with a series of new fluorine compounds, many more fluoride-bearing natural minerals had alreday been discovered (e. g. apatites, cryolite, hornblendes) by chemists of the time, and sodium and potassium fluorides had already been prepared. Berzelius then showed that the fluorides of ammonium, magnesium, beryllium, aluminum, cadmium, copper, lead, tin, antimony, uranium, and many other metals differ from their salts of any other acids known at the time, and thus confirmed that fluoric acid bears in fact a new radical (16a). But its isolation still posed a challenge. Until the French chemist Henri Moissan prepared elemental fluorine in 1886 (16), quite a number of researchers got an example of resistance by the way how vigorously it resisted any attempts to get it in the free state. Moissan prepared elemental fluorine by electrolysis (in a specially tightened apparatus) of liquefied, water-free hydrogen fluoride to which some potassium bifluoride had been added to increase electric conductance. Beginning shortly afterwards (17), a number of patents were filed on methods for the electrolytic production of elemental fluorine. Frank C. Mathers and C. O. Anderson (who later became president of the Ozark-Mahoning Company) conducted their electrolysis experiments in cooperation with the Chemical Warfare Service (17a) and published their results after World War I. Furthermore, it was Mathers´ interest in fluorine chemistry which led -somewhat later- to another “great discovery”. In Mathers´ set of chemicals, Joseph Charles Muhler found a bottle of stannous fluoride which became his favored “caries-preventive” additive to toothpaste. This discovery enabled him to continue his fluoride research work in a newly erected dental institute at the University of Indiana, i. e. in “the house that CREST built”. However, fluorine´s high reactivity and rather uncontrollable behaviour in certain reactions prevented any widespread uses of the element in the chemical industry for a long time. Most of its compounds were prepared, therefore, by tricky indirect reactions involving fluorides. Fluorine, a yellow gas (18), is the most electronegative and the most reactive chemical element. It reacts with nearly all organic and inorganic materials, even with gold and platinum. Hydrogen and fluorine react with explosive violence. With water, fluorine forms hydrofluoric acid and ozone. A jet of fluorine from a pressure container reacts with human flesh and can cause extremely severe burns that are very difficult to heal. Mechanisms of tissue destruction include destructive oxidation by fluorine, thermal damage from the heat of reaction, and tissue poisoning by HF formed. “HF is formed by the reaction of fluorine with moisture on the skin. HF is a protoplasmic poison with great penetrating power and causes deep-seated burns that heal very slowly.” Even the salts of fluorine (“fluorides”) which collect on the inside of pipes, valves and other equipment are extremely dangerous when inhaled or ingested, therefore “every precaution should be taken to avoid breathing or swallowing them” (19). In the United States, fluorine was used during World War II for the production of uranium hexafluoride, which, at elevated temperature, is a gas that may be used for the separation of uranium isotopes. The enriched radioactive uranium was used for the construction of the first atomic bombs which went down on Hiroshima and Nagasaki in 1945 (21,22). Uranium refining for nuclear energy is still one of the major uses for elemental fluorine. Given the high reactivity even in the presence of traces of impurities, it is obviously impossible to keep elemental fluorine in a free elemental state -except for a fraction of a second- under natural conditions.